The drugs are listed by category, according to the conditions they treat, then by brand name first, followed by the drug's generic name in parentheses. In some categories, individual drugs are not listed. For these conditions, you will want to discuss the possibility of hair loss as a side effect of using any of the drugs that treat that particular condition, since many do contribute to hair loss. Drugs.com - Contains prescription drug information for professionals and consumers. 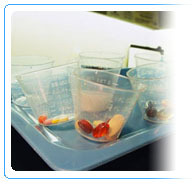 PDRhealth.com - provides drug information based on the FDA-approved information found in the PDR.